Summer Art Projects 2016 – Can’t Wait! Summer is the time to do some projects…it is always nice to have time off but creating a little art together is not only a nice change of pace when the weather is too hot or wet to be outside, but it also gives you an activity that can stimulate further exploring with art materials and ideas. Here are some to get you started. This lesson is actually a Youtube video! Make sure to view the artwork first (here is one to get you started) and then get them started on their own version of Kandinsky’s Circles. We had this project in one of our Hearts and Trees kits a few years ago. What an easy and entertaining afternoon project! We used varigated color yarn to make it easy. Create coasters for your family and friends. Use the woven pieces with dolls, nature tables, or playhouses. This link has visual ideas and a printable that you may wish to use. Always view some Mondrian color block art first! Then pull out your LEGOS for a fun hands on activity. These are going to take special materials and some patience. Aren’t they gorgeous? I am going to invite some friends over and we are going to make some to hang around the house.Here is the link to the painting to inspire you: Starry Night by Vincent Van Gogh. Send me a photo or leave me a comment if you complete any of the suggested projects with your family. Let me know how it goes! Need a quick artist study? Van Gogh can always come to the rescue! He is such a child friendly artist to study with his bold colors and his often whimsical style. He paintings can make you happy or sad, so much to talk about. I have on my resource shelf a set of six art postcards from Dover Publications that have been well used over our years of artist study ( only $1.99 on Amazon). We have viewed them, touched them, hung them on the wall, and copied them into our art notebooks. I highly recommend having art that your children can handle and view up close. This set of cards is a great starter set if you are just getting started with a more serious study of artists. I have linked the paintings above for future reference. You may wish to use the free Art Question Cards available here on Harmony Fine Arts. Here is a free printable notebook page for you to use with your Van Gogh artist study. If you want a more in-depth look at Van Gogh and his art, I invite you to look at my Harmony Fine Arts Mini-Unit. This is short six-week unit will bring more of Van Gogh’s amazing art to your homeschool week. Here is an entry I did a few years ago that was written after much study and thinking on the life of Van Gogh by my sons and I: Van Gogh -Digging a Little Deeper. Sketch Assignment Due June 8, 2015: Sketch your bedroom or just your bed with colored pencils. 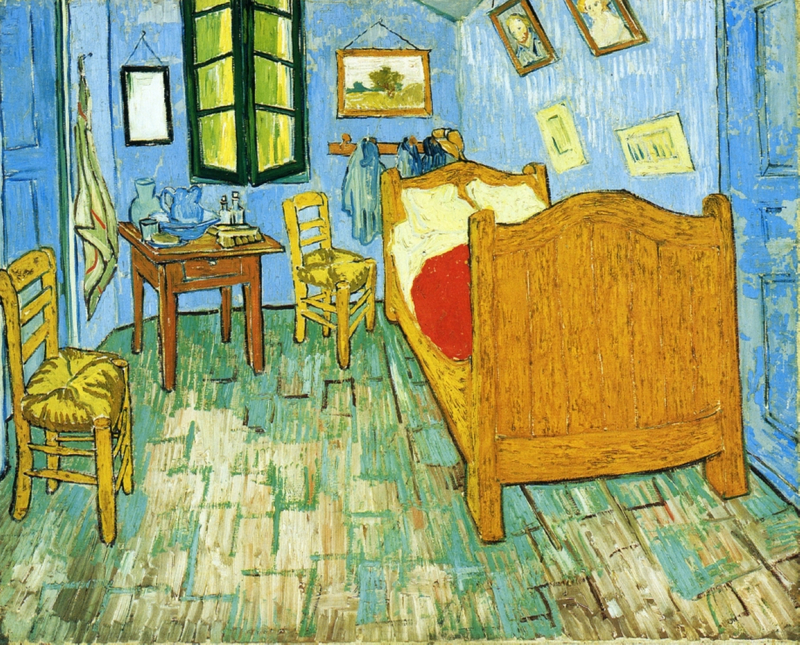 Make sure to view the painting of Van Gogh’s bedroom with your children and have them tell you what they see in the painting. You can use the Art Question Cards from this entry to help you get started with your discussion. : Art Question Cards-Help Picture Study. All sketchers are welcome and there is no need to sign up. Send in your sketches in jpg format and mail them to: [email protected] by Monday, June 8, 2015 and I will include them in Tuesday’s slideshow. Complete instructions are found by clicking the Sketch Tuesday tab at HarmonyFineArts.com.